The Fly6 combination camera/tail light has been popping up a lot lately with footage of face slams and car collisions, but just how good is the first seat post-mounted integrated tail light and HD camera? Value is a tricky one, as it's a camera/light combo currently in a field of one. 720p action cameras are coming down in price all the time and you could get a camera and a good light for the same price as the Fly6, but they wouldn't be a combination package and the camera wouldn't be designed to attach to your seat post pointing backwards and filming continuously. The combination of the two in the Fly 6 will set you back £109.99 which is expensive for a backlight, but cheap for the quality of camera you get. The Fly 6 is made up of eight LED lights surrounding the camera lens behind a protective plastic cover. Below this there is one main flashing LED above three more LEDs that create the flashing patterns. There are three brightnesses that can be changed from 100% to completely off. The LEDs surrounding the camera lens remain on whenever the camera is in operation. The flashing patterns and on/off functions are controlled by two buttons on either side of the light. It also has rubber, element-proof flaps at the bottom for the memory card and USB slots. Initially, I thought that these may fail when cycling through puddles without mudguards, but I am yet to have any kind of problems with them in 10 months of use and countless rain soaked rides. This is first and foremost an action cam. It allows you to film without having the stigma of looking like a teletubby that having a camera on your head brings. So how does the quality compare to other action cams? When I initially started filming I was worried that the LEDs surrounding the camera lens would burn out the picture and that as this was a brand new concept, it would not have been well thought out. I needn't have worried. The team at Fly6 have created not only an effective backlight, but a camera that has sharp imaging and crisp sound. The camera itself films at 720HD rather than the 1080 that many have become accustomed to. However, the quality of the pictures is still strong. The fact that it is embedded amongst lights does not cause image burning and you can only faintly register that there are LEDs placed around the edge of the lens. The quality of the sound and pictures has also remained high despite the conditions. In the video above, you can see that the weather is terrible and although a few drops of rain get onto the lens, they have little effect on the overall quality of the picture. The same unfortunately cannot be said, about the quality of the driving. 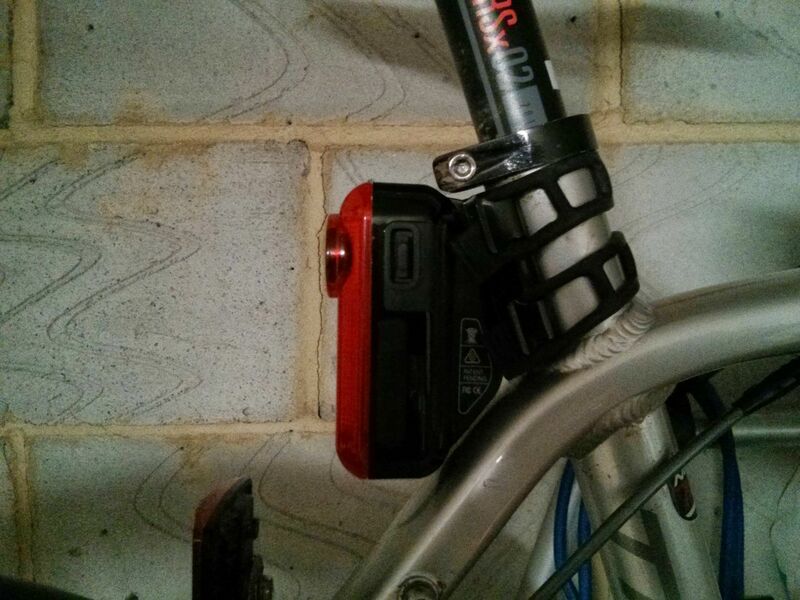 The backlight camera sits on the seat post below the saddle and attaches using a bracket and laddered rubber straps. The light itself sits in the bracket. This is meant to allow it to simply clip in and out, but in reality, it is difficult to do so and I have needed to use a knife just to unclip in the past. However, this is simply remedied by taking both the bracket and light off at the same time. It is so simple to fit that this takes the same amount of time as it would to clip or unclip any light. One of the few real issues that I had is the use of the light with a saddle bag. This is because it is quite long (around 10cm) so unless you have a particularly high saddle there is little real estate for both. I have got around this because I have a seat clamp that isn't too far extended, so I can simply put the bracket over the top. Battery life on the camera is claimed to be around five hours and I think that this is relatively accurate. I have been using the light for around nine months and on average I need to charge it once or twice per week. It beeps to let you know the percentage of battery that you are on, one beep signifying 25% of battery usage, so four beeps means fully charged, while one beep means you should think about charging. When the camera runs out of battery, it emits a loud extended beep (which is confusing for anybody around you on the road) but allows you to have 90 minutes of just the light, meaning that you can safely get to your destination. Charging and uploading of film can be done through USB. It also comes with a 8GB micro SD card that allows you to upload direct to the computer. However, if nothing of merit happens, then you don't need to do this. Undoubtedly, my favourite part of the camera is that it self-wipes. So after you have used up all of the memory, it simply starts recording over the oldest footage. This means that it can simply be left on the bike and you only need to charge it occasionally. Compared to other action cams that I've used, this is a real game-changer. No more realising that the great moment you thought you had recorded, you hadn't because you had run out of space. It means that you can have it turned on all the time. I have recorded everything from club rides to near misses whilst commuting using the camera, it really allows you to capture everything. It also has good safety functionality with its 'Incident capture protection technology'. This means that if you are knocked off your bike on a country road and the Fly6 is left on its side for 45 minutes, it will save the footage, without being overwritten. 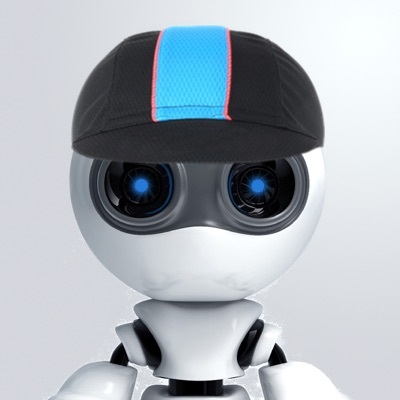 In conclusion, from using the Fly 6 for a while, I can safely say that it is a great innovation in cycling safety. It won't be for everybody and for some the price will be prohibitive, but from the protection it gives you (/content/news/134042-video-footage-convinces-police-aussie-cyclist-who-hit-car-was-not-wrong) especially if you have been in a disputed accident, it is unbeatable. Added to that is the fact that all you need to do is turn it on and leave it to record allowing you to record everything. It is aimed at both commuters looking at improving their safety on the roads and club riders who want to record everything that happens during their rides. They claim that 'it watches your back' and the premise is that people behave if they think they are being watched. The idea is to make people think that they could be being filmed whenever they see a red flashing light on the seat post of a bike. At the moment, it needs more adopters to achieve the second aim, but as a safety product that can help with disputed incidents or reporting dangerous drivers, it is practically in a league of its own. No problems with usability. Having used this for around 10 months, I have had nothing at all go wrong. The only reason it lost marks was the clipping system from the light to the bracket that can be taken off as a whole just as easily. Great as a camera and effective as a backlight, does exactly what it says on the tin. Used this for 10 months and had no issues with it whatsoever. Weighs more than most traditional backlights but when combined with a regular action cam, the difference is negligible. Impeccably, as a backlight and camera it is incredibly good. The continuous recording is a real game changer. A minor gripe, but the clip from the bracket to the light. The Fly6 could be the start of a new cycling craze or a flash in the pan, with the sense of safety I have had from using it, I hope it's the former. Is this a review of the original or updated model? a front one would be ideal! something I would consider! i bought a 'go pro' style camera, and no matter which way you mount it you look like an idiot with it on your head. a light camera would be discrete and simple! I've been riding with the second generation unit for about a fortnight now, having pre-ordered it earlier this year. It's slightly smaller with better battery life, optics, light, but costs more. I'm very happy with the purchase so far. It's just convenient to have one integrated unit that's no more hassle to take on and off than the existing taillight, especially for the short rides that I'll make during the week when the bike is simply transport. The only issue I've had is that the memory card it came with seems to be duff so I swapped it out. The second generation unit is now the default one sold by the developer, and costs £179 shipping from Australia. The first generation unit in the review can be bought in the UK at the much better price of £115 from JeJames. I agree with everything that's been said, it's a great product. I've liked it so much that I've bought the new version. If you fancy bagging a bargain then the old one's for sale via a well know Internet auction site. Just search for "fly6". Auction ends on Thursday 11th. They are developing a front camera. I can't remember where it was mentioned, probably their Facebook page, but it's something that I think they're going to unveil next year. i was waiting for the new version but at that price I think its going to be too steep. might just grab an old one. agree about the front, I just want something simple that doesn't make me look like a spod. Review of the new version is in the works at the moment. Be aware that the original one is quite long and doesn't really work well with a saddle bag. It's a really nice light. From a value point of view, it's pretty good, considering what you are getting. I understand the newer one is shorter and may be easier use with a saddle bag. Of note on long rides I use this + a back up light. Well, I own it and I agree with you, the price hike is too steep. It was discounted for those that pre-ordered, and I hope it comes back down to that level next year as that got it about right. It shouldn't have a price premium over buying a comparable action camera and rear light as separate parts. For a front camera, the dirt cheap option I've recommended before is the Mobius camera. It's a tiny little thing about the size of a box of matches that you can find for between £40->£60 on ebay. It isn't waterproofed and the battery life was awful. However, I use mine with a USB battery and it's been out in some storms and survived. The Chinese manufacturers have also just upgraded the internal battery, and I've just ordered one of those as a replacement and will see how that performs. It's a shame that it has a build in wedge shape! If you had the ability of mounting it upside down it would do away with the saddle bag blocking the camera issue, but then end-up partially obscure the lights. No constant light setting? That's just mental. The new version has a constant light mode. I had the same concern when buying it, although I use panniers or just a storage bottle for tools and tubes more than a saddle bag. It actually fits in really well on all my bikes, if you've got enough space just below the seatpost clamp it tucks away quite nicely. Thanks for all your comments & I'd like to address a few of them below! In terms of pricing, we agree with the sentiment above and feel our offering is great value. From our perspective, to have the longest lasting cycling camera on the market ranks highly in terms of value. The new Fly6 lasts two times longer than any of the top five action cameras available today and none of them are designed just for cyclists. None of them are treated with nano-technology and none of them have an integrated light. If you were to get the mid range action camera of any brand, add the necessary mounting accessories, add an 8GB class 10 microSD card, an equivalent flashing tail light then look at what you have spent, how much it all weighs, how much space it takes up and how complicated they can be to operate - you will come to the same conclusion that people from over 30 counties in the world have. The new Fly6 is incredible value. We of course are not saying it is the best camera or the best light. It is simply the best cycling specific device that is a HD camera and a bright flashing tail-light wrapped into one simple to use and effective unit. The price also includes VAT & custom duties for EU & UK delivery. We are designing a front solution (going to be called Fly12) at the moment hoping to have some more news on it early next year. We encourage people to subscribe on our website to stay in the loop on Fly12. It's the original price that's crazy if it's not fit for use. I've also been using the new Fly6 for a couple of weeks and it is a really nice piece of kit. I was fortunate to get it for the pre-order rate of £133. Hi Andrew, always nice to see a supplier post on a review. Really is a great product and exactly what I'm after. Brings the total to £188 which is just to steep. We've been using both the original and the new Fly6 on our club runs, but more importantly, on our commutes too. As a light and a camera in winter, it's valuable piece of kit. Like my helmet, I don't leave home without it. Value is subjective, but the quality and the combo of two devices in one, taking very little bike-space simply works. I've been using it now several months and happy with it. Records for 5 hours shame not 6 but I believe the new one does. I have a video in bad dark weather with my other cameras so u can see how good they are in the dark. The article suggests that "...the Fly6 is left on its side for 45 minutes, it will save the footage, without being overwritten." "...the bicycle (Fly6) is tilted over more than 45 degrees for more than 3 seconds."